In the first part of this survey, we have showed what proves that the Aboutaam brothers, the world's greatest antique dealers, have been clearly involved in the smuggling of Syrian antiquities for at least 16 years. We linked this evidence which is included in the documents of Zaman al-Wasla with many details in the biography of the brothers. In this part of our investigation, we continue to disclose more details in the Aboutaam file, concerning lawsuits against them that may be considered a criterion for transactions that have been successfully passed and completed without raising the suspicions of people involved in the pursuit of looted or lost heritage. The case of the rare Pharaonic funeral mask that came back to a lady named "Ka Nefer Nefer" who is also known as the woman with the "Multiplier Beauty", can be considered the most prominent problem that the 'Aboutaam' brothers have faced. Their company sold this mask to the American Museum St. Louis for $ 499,000 (720,000 Swiss francs at the time). The transaction was concluded in March 1998, with the assistance and blessing of the father and founder, "Suleiman Abutaam", who was killed with his wife "S" about 6 months later. Some have seen this as a curse of the pharaonic mask. who has already erased the life of his Egyptian discoverer Zakaria Ghoneim (who committed suicide in the waters of the Nile a few years after the discovery of the mask, because he was accused of abandoning some of the artifacts that were in his custody) . On the 2nd of September 1998, a Swiss plane crashed (Flight 111), in which all 229 passengers and its crew were killed, including Suleiman Abutaam and his wife, in the worst of aviation accidents in the world, because of the combination of fire and water, as the plane was burned in the air, then it plunged into the waters of the Atlantic Ocean near Nova. Scotia, Canada. But the victims were not the only element present in the air disaster, as the crashed Swiss plane was a mini-bank, carrying a silver case and precious objects whose values were not disclosed, but only their weight. First, there were 2 kilograms of diamonds (10,000 carats worth $ 50 million on average), 50 kilos of dollars (each $ 100 million weighs about 10 kilograms), and other acquisitions, including a painting by the famous painter Picasso, worth about $ 1.5 million at the time. All of this and others, as well as human beings, ended up burning or drowning in the depths of the Atlantic. The intensity of the fire that melted the metal of the aircraft, and then the acuity of its impact with the water. when he fell (more than 350 times the force of gravity), turned the device into small fragments (2 million pieces of debris were collected), and made sure to put an end to the lives of all passengers immediately, which made their identification difficult and eventually brought Canada into the largest and longest investigation of a nationwide air disaster, and pushed it to engage in the largest DNA test project for victims which the country has never known before. Egyptian archaeologists did not need a large or even a small screening project to recognize Ka Nefer Nefer's mask as soon as he was exposed to the St. Louis Museum, many years after his evaporation. In 1966, the mask was transferred to the Egyptian museum for restoration, it was deposited under the number 6119 then it was discovered "missing" during an inventory made by the museum in 1973. As if it has never existed. After about a quarter century of his disappearance, the pharaonic mask, estimated to be around 3200 years old, returned to Switzerland as one of the goods of "Aboutaam", which they sold to the Museum of St. Louis for " few cents", compared to the value of this treasure, which is difficult to be estimate at any price. Despite all Egyptian official attempts (for several years) to retake the stolen mask, the US judiciary declared its final decision in 2014 on this subject, declaring the mask is lawfully the property of the St. Louis Museum and that Cairo's claim regarding this piece is not eligible, because the American Museum had bought the mask of "double Miss" in a legitimate way! Thus, Abutaam's greed - the father as well as his sons - caused Egypt to lose an irreplaceable heritage, to be added to a long list of past losses, seen by extensive collections of Egyptian antiquities distributed in museums around the world, and seen as "legitimate" property of these museums. What happened with Egypt because of the Aboutaam, nearly got along in Yemen, where the brothers tried to sell a statue representing the "goddess of fertility" known as "Thet Hamim", for a price ranging between 20 and 30 thousand dollars, but the US customs administration stopped the operation after receiving documents indicating Yemen’s ownership of the statue, and confirming that it was looted from one of his museums, in the mid 1990s. The United States authorities confiscated the status of the Lebanese brothers in 2003 and then handed it over to Yemen. In Turkey, one of the Middle East countries afflicted by the looting of its antiquities, Aboutaam and fellow heritage brokers have found what they are looking for, so they trade-by buying and selling - innumerable treasures of this country, going back to different eras; this was under the eyes of the Swiss authorities, who opened the free zones for all kinds of commerce. In 2010, however, there was a dispute between Aboutaam and a very wealthy Swiss client, when he doubted the "identity" of what is called in Arabic Naous (a stone coffin) presented by the brothers . After some ups and downs, the Swiss authorities intervened for the verification, and they found that the origin of this naous belongs to Turkey, and that it is even one of the rarest coffins in the world with regards to its history, its sculpture and its size. Subsequently, the Swiss judiciary intervened and ordered the return of the naous to Ankara, which was actively pursuing measures for its recovery. The three preceding examples (the pharaonic mask, the Thet Hamim and the Turkish coffin) are capable of clarifying us on the method which the two brothers use to deal with the human patrimony in general, and that looted of the East in particular. , and can also raise doubts about a large number of Syrian antiquities mainly those transactions that could not be documented for any reason; knowing that the two brothers have devoted an independent section for Syrian antiquities in the websites of their companies and galleries, some of the anquities have already been sold, and some of them are still waiting for a "client". Amongst these Syrian archaeological "goods" is the statue of a Tel Helf woman who deserves 16,000 Dollars, a "Fatimid" dish from the city of Tlemcen, and other pieces - difficult to estimate their historical and symbolic values ​​- but can be bought by whoever wants them and that he can pay for them. In the first part of our investigation, we had spoken of the mystery of the upheaval that prevailed among traffickers towards Syrian monuments. The reason for the coup is related to the war in Syria, specifically to the existence of the "Islamic State" which is classified as a terrorist organization and has been declared involved in the looting and commercialization of historical artifacts ransacked in Syria during its control over large parts of the country. We have documented the evidence that Abutaam's interest - in the case of the two items confiscated in Belgium in early 2016 - was to deny that the first was of a Syrian origin, and to claim that the other was looted before Isil controls the "Mary" archeological site in the region of Abu kamal. But the objections presented by Hisham Abutaam in his trial, which deny the identity of the first piece and claim that the other was not looted by the organization, are ultimately theoretical and controversial, if not disputed arguments. and rejected, compared to the black history of the brothers concerning the traffic of the sacked pieces. Their past is fixed and cannot be denied or concealed by the redundancy of the vocabulary like: integrity, probity, honesty, etc ..., which dominated a great part of the official text of "Abutaam" against the Wall Street Journal. It is truly remarkable that the Wall Street Journal investigation, released in the summer of 2017, is causing Hisham Abutaam's anger to the extent of pushing him to move on for a lawsuit against the American newspaper, while he did not react in the same way to a previous and more enlarged investigation published by the Belgian magazine "Paris Match" in the autumn of 2016, in which she spoke clearly of what has been called the "blood antiquities" market. "famous in Belgium, and its possible links with the organization of the" Islamic State "and its terrorist attacks in Brussels and Paris, in particular. The "Paris Match" investigation was an essential point for several reasons: first, it was published by a prestigious Belgian magazine covering a very sensitive and dangerous subject dealing with the mysteries of the antiques market and masterpieces in Belgium, a country considered as the seat and the corridor of the great majority of the jihadists who cross the West towards Syria, most of which have joined Isil, from where the title deserved to Belgium like the capital of the jihadists in the West. These factors that came together in the "Paris Match" investigation made it exceptional with its circumstances, its subject and its projections, which forced "Zaman Al-Wasl" to rely almost entirely on this inquiry to clarify relations between Aboutaam as well as art and antique dealers with the organization of the Islamic State. Through going back to this investigation and translating it, "Zaman Al-Wasl" found that the Belgian magazine first noted the enormous revenues of the antiques and artifacts market all over the world, which can reach, according to some estimates, 8 billion per year (as in the CIA reports), which are also revenues from the black market for antiques and works of art, where the exchange is made against any legal or even ethical norms. According to Paris Match, the phenomenal growth of the imports in the arts and antique market is due in part to the increasing pillaging of historical and cultural sites in the Middle East, mired in chaos and war, particularly in Syria and Iraq. . This looting was aggravated by the emergence of the Islamic State organization which controlled about 4,500 archeological sites in Syria and Iraq (including sites on the World Heritage List, with about 100,000 artifacts archaeological sites, sufficient to create a vast market of monuments associated with the smell of blood, carnage and desolation, and which was popular among cross-border traffickers and gangs. 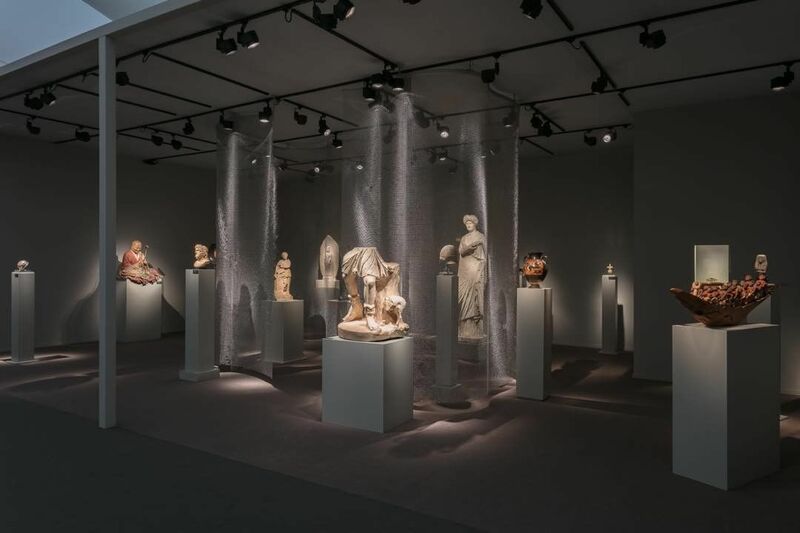 It is not surprising that many of these looted artifacts pass through Belgium as this country is known as the capital of the European Union, and at the same time a capital for the circulation and trade of art and world heritage, and parallel to that also the capital of Western jihadists. In addition to these combined factors, there is also formal inaction and legal loopholes in which brokers find an exit. In order to realize the size of the black market for objects passing through Belgium, it is sufficient to know that the authorities of this country have informed INTERPOL of 2,000 antiques and stolen artifacts, reflecting an image of the scale of this market and its "efficiency". After all, for whatever reason there must be illegal transactions that go unnoticed by the authorities, in the midst of a relentless effort and persistent insistence by gangs and brokers, to make breakthroughs and carry out suspicious transactions. The Abutaam brothers are only a sample of this determination. At the beginning of 2016, when they challenged - and they even mocked - all the procedures surrounding the ancient archaeological world in general, and the Syrian in particular, and sent two pieces - to be exposed and sold - in the most famous exhibition of art and archeology "Brava", which is considered as the culmination of an annual event organized at the level of Europe as a whole. 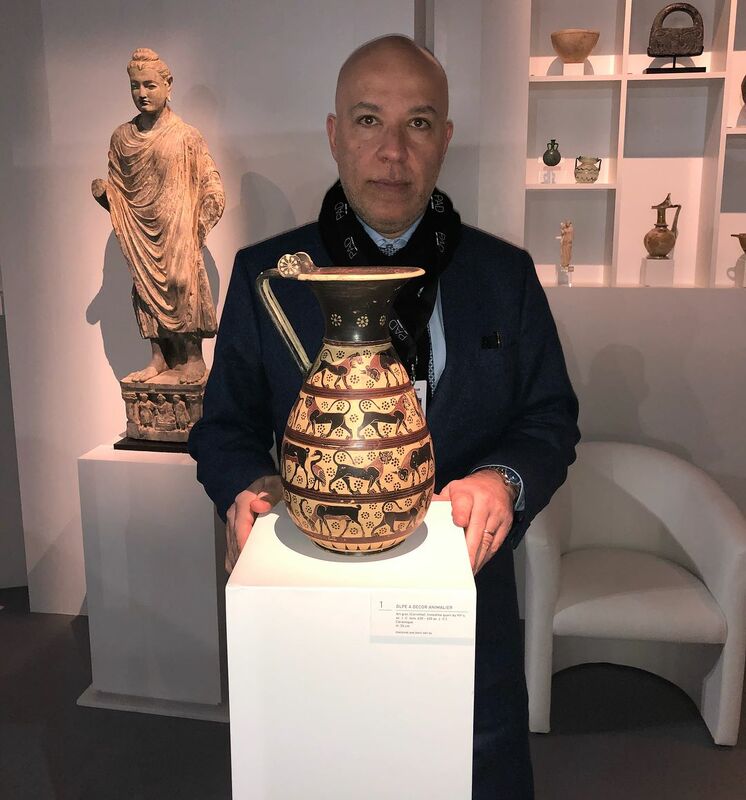 Belgian customs quickly confiscated the two pieces sent by the "Aboutaam" brothers, suspecting that their commercialization was a violation of the strict global ban on Syrian antiquities (under Security Council and UNESCO resolutions) . It was also suspected that one of the two pieces is connected to the organization of the "Islamic State", as no one disagree that this particular piece is part of the treasures of the Kingdom of Mary (the third millennium BC.) In eastern Syria (the region of Abu Kamal). As we have already revealed since their biography, it was not surprising the commitment of "Aboutaam" in such a suspicious transaction, and he could have not even shook an eyelash on its discovery (based on previous experiences where they could easily evade or just had to pay negligible penalties). Although, the case this time is different since it has links with the organization of the Islamic State and the Aboutaam know perfectly and consciously that the fact of proving this link is able to destroy their reputation, and maybe even their past. and their future and a significant part of their fortune. This explains why they have faced this accusation vigorously and relentlessly, through the media and the courts. However, this fierce confrontation to be exonerated from the association with the "blood artifacts" that the organization markets has apparently been futile so far. The proof is that the Belgian authorities had proceeded and opened a criminal investigation of the case a short time ago. Nobody knows where the investigation will take place , what the results will be like, what information will be disclosed or even which networks will be charged. In order to know the seriousness of the "blood artifact" file and the delicate position of "Aboutaam" in the Brava case, it is enough to know that it is not only a question of the probability of trading with Isil looted goods, but the possibility that the product of this trade is used to finance the organization and its bombings in several cities around the world, in particular Brussels and Paris. At this point, the question becomes complex and too sensitive to be neglected. Take, for example, the disclosure of information that one of the perpetrators of the deadly attacks on the airport and the Belgium subway station has been actively involved in the trade of artifacts and antiques, and that this involvement dates back to relatively recent times.He is a person whose biography talks about the existence of links with influential figures in the organization and, in particular with "Salah Abdel Salam" who is accused of orchestrating an attack in Paris in the autumn of 2015 and left 130 people dead and hundreds wounded. When it comes to comparing two extremes, some choose to refer to the organization of "Islamic State" as "Black Isil", while referring to the "Hezbollah" militia with the words "Yellow Isil" . We have already focused on the possible links between the Abutaam brothers and the "Black Daesh", an issue that is on the way to become a criminal investigation, but what has yet to be put on the track of criminal investigation and even not a journalist before, that's what Zaman al-Wasl is going to clear up in this part. We are talking about the links that connect the family - even the clan - Aboutaam with the Hezbollah militia, especially its leader, Hassan Nasrallah. According to the testimony of the experts of Family Trees concerning families living in southern Lebanon, the blood relationship between the Abu-Ta'im family and the Nasrallah family is very strong and solid. Indeed, "Nasrallah" clan who lives precisely in Bazouriyeh - the home town of the leader of the yellow militia - is a branch of the Abutaam family from the village of Taybeh in southern Lebanon, which means that Aboutaam is the origin of the tree and Nasrallah is only a branch of it. Eventually the first grandfather of the Nasrallah is a person from the Aboutaam family. The connection of "Aboutaam" with Hezbollah militia is not new, it is not limited to the coordination between them to get rid of Israeli conquest of the South, nor the subsequent participation in the invasion and occupation of Syria, but it is also associated with participation in the fight against the people of the country (Lebanon) itself, and contributing to the crimes of population change, based on communal bases. In a rare report, previously published by our colleague "Naw", she spoke of the facts of emptying the southern suburbs of Bayreuth of Christians, a step towards its preparation to be turned into a colony of a single partisan community. In this report, one of the sons of the "Aboutaam" clan has been designated as one of the financial pressure instruments used by Hezbollah. "against the remaining Christians in the southern suburbs of Beirut, after his absolute military control in 1988. After the military incursion, which contributed to the displacement of a proportion of Christians, the land invasion has began to ensure that the remaining ones will be displaced and expelled from the southern suburbs of Beirut; to achieve its goal, "Hezbollah" employed people whose mission was to buy land and property from Christians there (peacefully or through intimidating them), and one of these persons was from the family of " Aboutaam ", as well as other known Shia families. "Al-Taiba" located in "Jabal Amel" of Nabatiyeh province, which some of its inhabitants are whispering a hereditary melody that said: "on the pilgrimage we are no longer going / Al-Taiba is the Mecca of our mountain", and which was occupied by the Jewish state for more than 20 years, during its occupation of the South, before leaving in the summer of 2000; this Taiba was the stronghold of the Abutaam family, who classify themselves as the sovereigns. They have and continue to pump fighters and leaders into the Hezbollah corpus, among them those who are killed and those who continue to practice and encourage murder. Among the most eminent dead of the Aboutaam clan is "Ali Ahmed Abutaam", where the epitaph of "Martyrdom, Fighter, and Mister" is written on his tombstone and was mourned on July 25, 2014, who died while fighting in Syria and killing the Syrians, at the same day as "Hamza Yassin", the nephew of Nasrallah's wife. The two mercenaries are likely to be killed in the same place, fighting under the same sectarian and family banner that brought them together alive and dead. And "sovereignty" in the "Aboutaam" dictionary is like a skin that cannot be removed even if man lives in the four coins of the earth for decades, which is reflected by the clear reference of "Ali Abutaam "in one of his rare interviews when he prides himself on being a" Shiite nobleman ", and also boasts of having spent 150 million francs in Switzerland (about 152 million dollars) since his arrival 30 years ago. It may be difficult to equate the actual size of the fortune of the "Abutaam" brothers, and the returns they extort from antiquities and artifacts’ transactions (legitimate and illegal), but the recognition of "Ali Aboutaam" of spending more than $ 150 million, is relatively indicative of the property and financial assets he owns, which allows him to spend on average about half a million dollars a month, and about 14,000 a day, without fear of nothing. Have we just said that Ali Abutaam, who sits on a pyramid of companies and exhibitions selling the most valuable antiques and monuments and the only partner of his brother Hisham, is afraid of nothing? May be! But we must be careful not to drag ourselves behind this assessment, and we reveal to our readers - to conclude - the information that the man is suffering from lymphoma, which is classified as one of the "malignant tumors of the blood". Is it a curse of "blood artifacts" .